How About a Flying Hovercraft For Your First Car? Every teenager dreams of having his first car. Unless your dad is a millionaire, though, you’ll probably end up with a ride that is not exactly the car of your dreams. I wouldn’t be surprised if a lot of you guys can attest to that. But let’s just say that you have cash to spare, and you really want your first car to stand out. How about a flying hovercraft? Sure, it might not suit every day purposes very well, but heck, if your car can hover and fly, what else would you want? We all know the name Hammacher Schlemmer. For some of the weirdest – useless or useful, you judge – things you can find. They might just have outdone themselves with the flying hovercraft. This baby does work, in case the skeptic in you is raging at the moment. 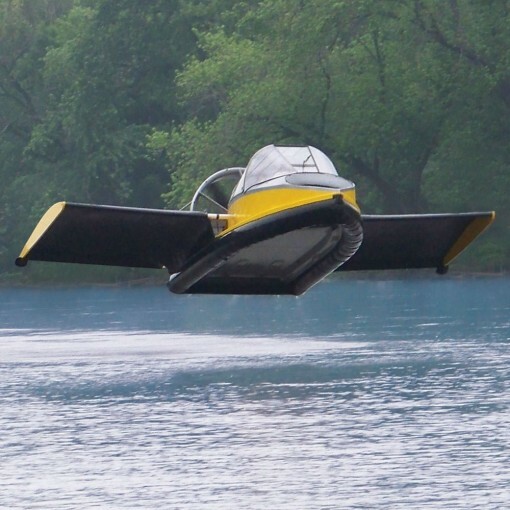 The flying hovercraft can glide over land and water, making it useful in most terrains. Additionally, it can fly – for real – and reach up to 70 miles per hour. As for inclines, as long as you do not go over 30 degrees, you’re fine. Not bad, huh? That pretty much covers everything, doesn’t it? Let’s talk fuel. The flying hovercraft has two nine-gallon gasoline tanks. That means you can fly – or glide – for 160 miles. You do the math with the gasoline prices today! Oh, and the hovercraft can carry 600 pounds at a time. That should be enough for several people, including payload and cargo. Here’s the ouch part: it costs $190,000. So yeah, forget about the first car idea. If you do have that money, though, go check it out at Hammacher Schlemmer.